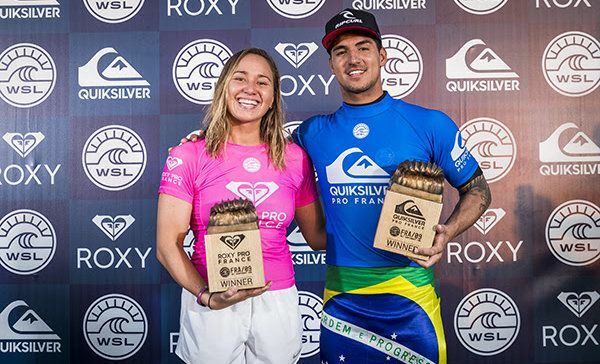 Your 2017 winners of the Roxy Pro & Quiksilver Pro France, Carissa Moore & Gabriel Medina. – FITZGIBBONS RETAINS FRONTRUNNER POSITION HEADING INTO FINAL EVENT OF SEASON.CARISSA JUMPS TO #4. Today’s Call: Event complete – congratulations Gabriel Medina and Carissa Moore! HOSSEGOR, France (Saturday, October 14, 2017) – Gabriel Medina (BRA) and Carissa Moore (HAW) claimed victory today at the Quiksilver and Roxy Pro France, respectively, in excellent three-to-five foot (1 – 1.5 metre) rippable peaks at Stop No. 9 of the World Surf League (WSL) Championship Tour (CT). 2014 WSL Champion Medina built momentum all week to peak at the perfect time in the final series and put together two massive heats in the Semifinals and Final to win the Quiksilver Pro France. His final bout against Sebastian Zietz (HAW), held in picture-perfect conditions at La Graviere, was the third French win of his young career. The Brazilian’s triumph today not only marks his eighth Championship Tour win, but it also vaults him from 8th to 3rd place on the Jeep Leaderboard, placing him well within striking distance of the World Title behind Florence and Jordy Smith (ZAF). Medina will now look to continue his success on the European leg at the next stop on the Championship Tour, the MEO Rip Curl Pro Portugal, which opens on October 20, 2017. In the Final Medina was first to gain momentum as he attacked the long rights with his signature vertical hacks to put a 14.84 (out of a possible 20) heat total quickly on the board. Medina continued to build and pushed his total up to 16 points to claim a third win in France and his first victory this season. Former World Champion Gabriel Medina of Brazil breaks boards to Win the 2017 Quiksilver Pro France. PHOTO: © WSL / PoullenotGabriel jumps to #3 from #7. His 1st win of the season. This is his 3rd win in France and his 8th CT Victory. He is now in the title hunt going into Portugal. 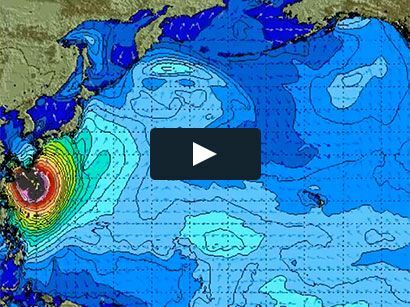 The incredible surf conditions at the Quiksilver Pro France, Stop No. 9 of 11 on the 2017 Men’s Championship Tour, elevated the level of performance to new heights and witnessed Medina earn his third Quiksilver Pro France win. The 2014 WSL Champion showcased his dominance today after defeating Zietz in the Final, reigning WSL Champion John John Florence (HAW) in the Semifinals, and 2012 WSL Champion Joel Parkinson (AUS) in the Quarterfinals. The runner-up finish for Zietz is his best result in 2017 and the second Finals berth of his career. The 29-year-old surfer will now move up four places to 11th on the rankings. En route to his matchup with Medina, Zietz dispatched World No. 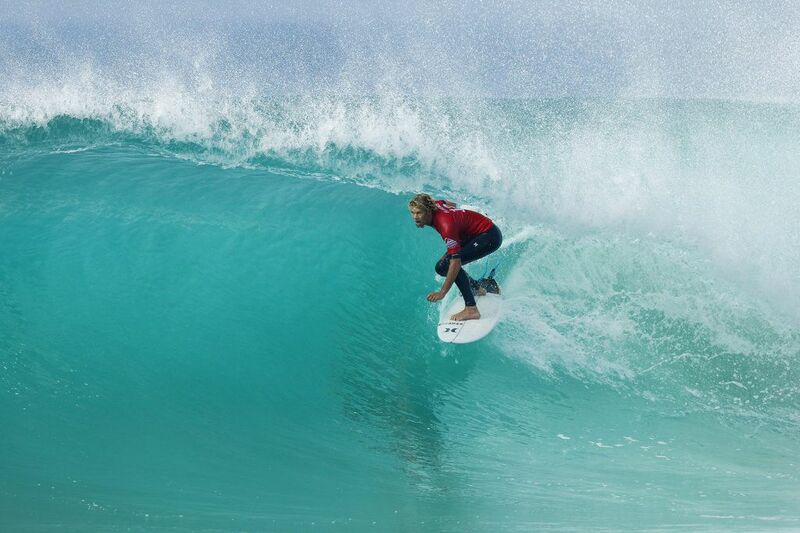 4 Owen Wright (AUS) in Round 5, Miguel Pupo (BRA) in the Quarterfinals and Kolohe Andino (USA) in the Semifinals. Kolohe Andino’s (USA) French run ended when the Californian faced Zietz in the Semis. The Hawaii surfer found one of the last few remaining tubes of La Graviere and made the situation difficult for Andino. With his second Semifinal finish this season, Andino will jump two spots into the 10th position on the Jeep Leaderboard. Florence went head-to-head with Medina in an epic Semifinal clash where both surfers took the debate to the air. A very slow start of the match-up almost ended in a heat re-start but the two aerialists found plenty of opportunities in the second half of the semi to put on an amazing show for the crowds. The reigning WSL Champion had a blasting path to the Semis with no less than seven 9-point rides in the previous three heats and all of the event’s highest heat totals. With an equal third today in France, the Hawaiian will head to Peniche wearing the Jeep Leader Jersey, moving past Smith who was eliminated in Round 3. Marc Lacomare’s (FRA) incredible run as a wildcard ended in the Quarterfinals where the Frenchman couldn’t complete a decent ride and fell to Andino. The result marks the first time a French surfer has reached the quarters in a very long time and gave a great glance at Lacomare’s potential as a future Championship Tour surfer. Three-time WSL Champion Moore claimed back-to-back wins at the Roxy Pro France today, elevating her game to a whole new level and putting herself back in the World Title conversation by dispatching Lakey Peterson (USA) in the Final. The Top 4 separated by 5600 between #1 Sally F. and #4 Carissa M.
Stop No. 9 of 10 on the 2017 World Surf League (WSL) Championship Tour (CT), the Roxy Pro France, was equally graced with incredible conditions for the world’s best female surfers, culminating with Moore’s victory. The three-time WSL Champion claimed her first event win of 2017, putting an end to an unusually victory-poor season. The Hawaiian started building momentum in Portugal last week where she placed runner-up and took one step further today to claim back-to-back titles at the Roxy Pro France. Today also marks the Hawaiian’s nineteenth Championship Tour win. Moore’s path to her back-to-back win at the Roxy Pro France was the longest it could have been as she surfed in all seven possible heats of the event. Despite being relegated to the difficult elimination rounds early on, Moore’s determination paid off with wins over current World No. 1 Sally Fitzgibbons (AUS), Stephanie Gilmore (AUS), Silvana Lima (BRA), Pauline Ado (FRA), and eventually Peterson in the Final. In a slow start of the Final, only Moore was able to build a little momentum with a couple of small scores while Peterson struggled to find a good wave. Moore stepped up ten minutes in with an incredible ride to post a 9.20 (out of a possible 10) on a combination of carves for a strong lead over the Californian. Peterson fought back with an excellent ride of her own, an 8.27 to get back in the heat. A final opportunity came for both surfers in the dying moments of the final, but Peterson failed to capitalize and Moore walked away for the win. Peterson’s second place result in France equals her best finish in 2017 as she also earned the runner-up spot at the Roxy Pro Gold Coast earlier this year. The Californian shined through a difficult draw to earn 8,000 points, which advance her up to 6th place on the Jeep Leaderboard. 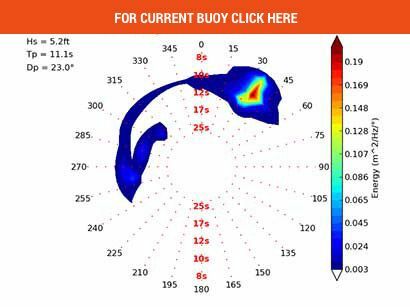 The 23-year old has posted impressive results this year, but will look to Honolua Bay for a strong finish to the season. World No. 1 coming into Hossegor, Sally Fitzgibbons (AUS), could not match Moore’s flair in their Semifinal clash and claimed an equal third place for the fifth time this season. This excellent result further solidifies the Australian’s position on top of the Women’s Jeep Leaderboard heading into the final event of the season in Maui, Hawaii. The reigning World Champion and a finalist last year in France, Tyler Wright (AUS) brought her A-game to the Semifinals but found a massive hurdle on her road to the final as Peterson posted a near-perfect 9.43 opener. With a third Semifinal finish in 2017, Wright will move up to second on the Jeep Leaderboard with a shot at defending her maiden World Title in Hawaii. Coming off a difficult week in Portugal where Wright sustained a knee injury prior to the event start, a hard-working road to recovery with her entourage saw the powerful regular-foot come back to form just in time to compete in France. Highlights from the Quiksilver and Roxy Pro France are available at WorldSurfLeague.com, the WSL app and on the WSL’s Facebook page. The next stop on the 2017 WSL Men’s Championship Tour is the MEO Rip Curl Pro Portugal, which gets underway on October 20 2017 and runs through October 31, 2017. For all results, photos, video highlights, press releases and LIVE webcast, log on to worldsurfleague.com or the WSL mobile app.